I’ve been on a quest to find the perfect Vegetarian/Vegan burger, and I think it’s finally happened. There are a couple others I love too, but this one is my favorite. It’s so delicious, and so good for you, you can eat a burger every day and not feel guilty. 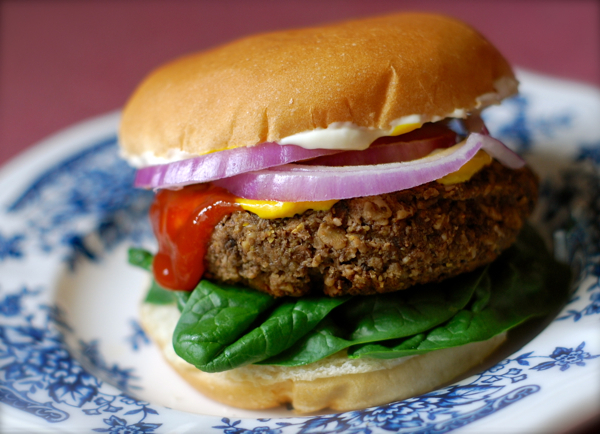 I started by using Mark Bittman’s recipe for Mushroom Nut Burgers (from his VB6 Cookbook.) Then I changed it up to make it more “beefy” tasting by adding a little soy sauce and Worcestershire sauce. I added more olive oil and oats to mine too, and used walnuts in place of pecans. I also added some cornmeal. I hope you love these as much as we do! Place one of the cups of old fashioned oats (not quick-cooking or instant) in a large mixing bowl. Place the other cup of oats in the bowl of a food processor and pulse until you have a coarse meal. Transfer to bowl. Add cornmeal as well. Pulse the garlic in the food processor until cloves are broken up a bit, then add the mushrooms. Pulse until finely chopped, being careful not to turn the mushrooms into puree. Add mushrooms and garlic to the bowl with the oats in it. Put the walnuts in the food processor and allow machine to run until nuts are ground to a thick paste. Scrape this nut butter into the bowl using a rubber spatula. Add the rest of the ingredients to the bowl, RESERVING 2 OF THE TABLESPOONS OF OIL, and mix, using your hands, until all ingredients are distributed evenly. Refrigerate burger mixture for 10 to 15 minutes, and then form into 8 patties. Place the reserved oil in a large, non-stick frying pan over medium heat. Once hot, add burgers (only cooking 4 at a time.) Cook undisturbed until they’re browned on the bottom and release easily from the pan (3 to 5 minutes.) Carefully flip burgers, lower heat a bit, and cook an additional 3 to 5 minutes. Don’t try to move the burgers around as they cook or they’ll stick to the pan. Repeat with the last 4 burgers, adding a little more oil to the pan if needed. Serve burgers on a bed of greens with your favorite vinaigrette and other veggies, or serve them as you would a traditional burger… on a bun with all your favorite toppings! Note: Once leftover burgers are cool, transfer them to an airtight container and refrigerate for up to 5 days.